As a doula, I often have the honor of supporting women as they welcome their babies into the world. 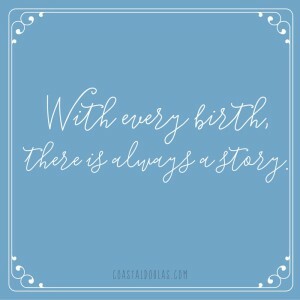 Every birth story is unique and different from the one before and the one after. There are 2 things though, that they all have in common, and that’s an immense amount of courage and strength. Whether you choose to birth your baby at home, in a hospital, or at a birth center; I believe in you. If you choose a cesarean section, to wait until spontaneous labor begins, or to schedule an induction; I support you. Maybe you decided on an epidural, to birth in water, or to try for a VBAC; I applaud you. As we near closer to Mother’s Day, we here at Coastal Doulas would love to honor all of the strong & courageous mothers in a special “Celebrate Motherhood” Blog Series. We know it took strength to make the best decisions you could for you and your baby. It doesn’t matter how or where you birthed your baby. You have a story that’s worth telling, and we know that when you share your story, it will empower other moms as they birth their babies too. Please submit your pregnancy and/or birth story to us at coastaldoulasofpalmbeach@gmail.com. Your stories will be shared on our Blog, Facebook, & Instagram pages during the week of May 1-7, 2016. All submissions are due by April 25th. We will let you know once we have received your story and will also let you know the day and time your story will be shared, so that you can share it with your friends and family. If for any reason you prefer to have your story shared anonymously, please specify that to us at the time you submit your birth story. Feel free to include any pictures you would like attached too. I look forward to reading all of your courageous stories!